With the holidays right around the corner, now is the perfect time to start thinking of ways to thank the people supporting your business: your clients! Promotional gifts for clients are a great way to show your appreciation while reminding them why they choose to support your brand. If you’re a small business on a budget or have many clients you want to thank, there are plenty of cost-effective promotional products that don’t compromise on quality or wow-factor. Fine ballpoint pens are a classic gift that anyone will appreciate. The Dominion Rollerball Pen with Gift Box has a reasonable price point and standout chrome detailing. Proudly display your imprint on the pen and pair it with a branded Regatta Notepad. Your brand will be the one they reach for every time a new idea comes to mind! Whichever gift you choose, be sure to attach a personalized thank you or holiday card. For a more high-priority client, consider giving them a promotional gift set! Gift sets have the benefit of removing some of the guesswork you might otherwise have when buying for a client thanks to the variety of pre-curated items. Gift sets also encourage sharing with family, friends, or the office, effectively spreading awareness of your brand. Consider a traditional gift basket like the Coffee and Cookie Basket with 20 Oz. Himalayan Tumbler for a complete gift that will boost their energy and their spirits! Or if they prefer a different type of beverage, opt for the beautiful Personalized Wine Accessory Set, which comes presented in an elegant solid wood box with a personalized chrome plate. For an extra personal touch, try pairing the wine accessory set with a bottle of your choice in the Leatherette Wine Bottle Bag. This is the type of thoughtful gift your client will remember for years to come! 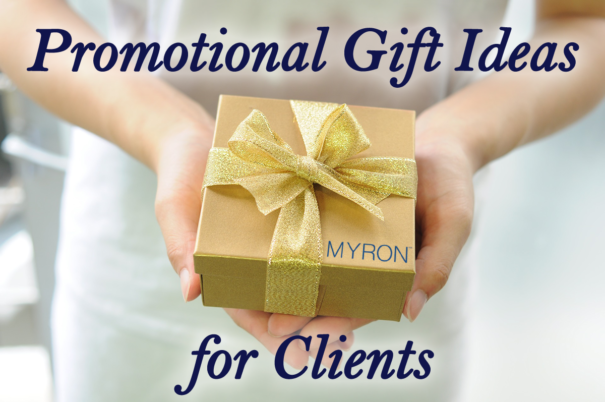 Thank your clients this year with promotional gifts from Myron. With our high quality standards and 100% satisfaction guarantee, our personalized gifts will be sure to impress your clients and show your appreciation.